Dr. Chao brought 3T technology to Delaware in 2007—almost 7 years ago. We have the most experience in the use of 3T MRI. Check out our website for more information about Dr. Chao and MRI Consultants. At MRI Consultants and BEST OPEN MRI we pride ourselves in caring for our patients. 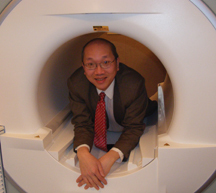 Dr Chao has studied MRI since 1983—and it was only invented in 1981! Dr. Chao worked on some of the preliminary research in MRI and MRA technologies, the prostate coil, shoulder coil, phased array technology, breast imaging, and spectroscopy. There are so many uses of advanced MRI. DWI (diffusion weighted imaging) can detect early GI and pancreatic cancer. It can see areas of tumor in your brain which are not visible on routine scanners. Quantitative MRI imaging can detect the results of brain trauma. Our offices provide DTI imaging which shows microscopic brain damage. We have SWI (susceptibility imaging), which shows minimal microscopic brain hemorrhages. This effect triples in sensitivity when used on a 3T MRI scanner and, at 7T (not yet available for clinical use), one can see even more hemorrhage than at 3T. All of these advances in technology radically change the requirements for brain imaging. The presence of hemorrhage changes the treatment of most brain disorders … and 3T MRI is the best way to detect it. A well-informed physician would know to ask for SWI or DTI when ordering an MRI of the brain—and they would insist on 3T. 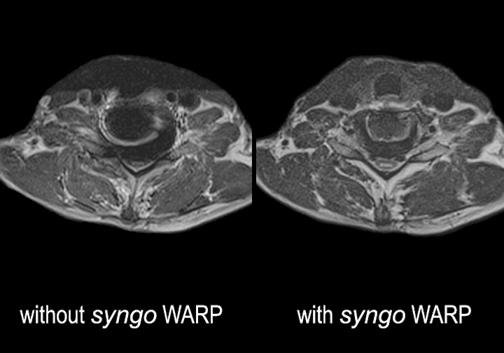 WARP is another example of technology available at MRI Consultants that is not generally available in the area. WARP metal subtraction helps reduce the effect of implanted metal near the area of a scan. This is super software (see sample image). We also use BLADE and NATIVE. MRI Consultants believes in investing in technology and Dr. Chao does his best to stay at the cutting edge of innovation in order to provide the very best imaging possible. When your doctor recommends you for an MRI, make sure you are going to a facility that has good equipment and an experienced radiologist writing the report. It’s never a bad idea to ask the name of the doctor who will be writing the report. The quality of the MRI scanner is important … but the experience of the person interpreting the images can be equally as important. Don’t accept inferior quality—it makes a huge difference in the outcome of your healthcare. Proton spectroscopy lets us see tumors using a different MR technique. It actually shows the chemistry of a tumor, which helps determine if a tumor or mass is indeed cancer. We do this routinely for pre- and post- contrast studies at our Lewes magnet. DTI lets us see early and subtle brain damage that other scanners simply cannot see. We use it for prostate cancer imaging as well. We can estimate the Gleason stage of prostate cancer using this tool. Combined with prostate spectroscopy, this makes for the most advanced prostate MRI studies in the world—and our out-of-pocket fee for this is only $700! 3T Breast MRI shows 100 percent of cancer with higher detail, specificity and sensitivity. MRI Consultants has been doing this for 7 years and, so far, we have not had any false positive biopsies. That’s a pretty good track record. We follow and biopsy lesions but we have had a very high positive rate about 90% concordance in what recommend for biopsy. That’s way high… much better than numbers at 1.5T. We also want to do proton spectroscopy for breast lesions. This is routinely done in Europe as it helps to make a diagnosis of cancer without having to actually do a biopsy. Dr. Chao wrote some of the first papers on wrist MRI, presented multiple talks on hip MR imaging, spectroscopy, MRA, MR of scar tissue, and MRA of aneurysms. He was voted top doc in Radiology in 2012. We offer conscious sedation. We also offer conscious cutting edge technologies in MRI that are unavailable elsewhere. There is a simple test of aortic wall thickness and clot, which predicts heart disease in the recent Dallas Heart Study. It is a revolutionary way to screen our patients for possible heart attack. We can do this in our Lewes office with the same pulse sequences that they used and with 3T speed and resolution. 3T is much better than twice as good! ← Previous Story Brain Balance Centers Change The Lives Of Children With Learning Disabilities Without Drugs!